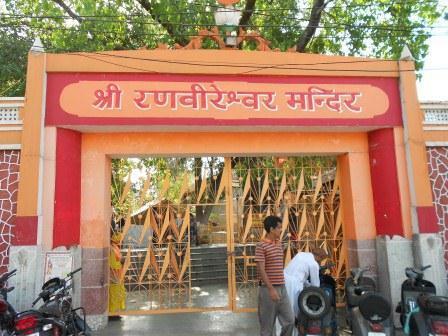 Ranbireshwar Temple is a holy shrine dedicated to the abode of lord Shiva. It is likely to be considered as the twelve Jyotirlinga temples of Lord Shiva in India, very much famous for his large number of shiva Lingas presence in it. As, Per the ancient belief, Lord Shiva appeared in the dream of Maharaja Ranbir Singh Jamwal, and thus the king built the temple in this area. 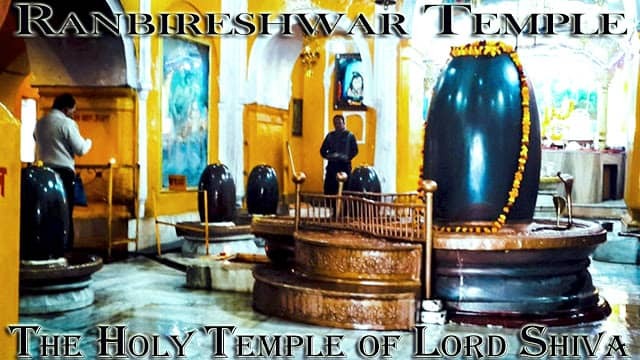 Before going to elaborate more on the glory of Ranbireshwar temple, we should know more on the Maharaja Ranbir Singh who was the founder of this ancient temple with historic importance connected with it. Maharaja Ranbir Singh, was known as General Shriman Rajrajeshwar Maharaja-dhiraj Sri Sir Ranbir Singh ji, Indar Mahindar Bahadur, Sipar-i-Sultanat, Mushir-i-Khas-i-Kaiser-i-Hind GCSI, CIE, Kaiser-i-Hind, was the head of the Jamwal Rajput clan and also Maharaja of the princely state of Jammu and Kashmir from 1857- 1885. He was born in August 1830 and belonged to the Dogra Dynasty. During his reign, the trans-Himalayan regions of Gilgit, Hunza Nagar and Astore were conquered and included in the territory of Jammu and Kashmir. Ranbir Singh was a well known and reputed scholar of classical Persian and learned English, Sanskrit and Pashtu and was also learned in Swedish and English and had great Passion for learning in ancient scriptures and literatures including Jyotish, Tantra and Mantra. Those manu-scriptural work of Maharaja Ranbir singh are still available in the library of Maharasjas. Maharaja Ranbir Singh was also most renowned for his patronage of learning and scholarship and earned the esteem of his subjects. Even he set up a department for the compilation and publication of significant works on the Hindu Law and Ritual in Sanskrit language; and for the translation of Persian and Sanskrit manuscripts into Hindi language as well including Jyotish, Tantra, Mantra and gathered it from accross all over the india. This compilation of Sanskrit manuscripts, now preserved in the Raghunath temple library, is amongst the most valuable works in the country. 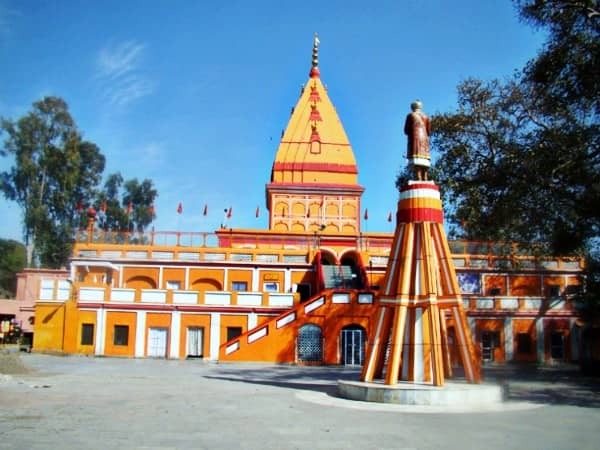 Ranbireshwar Temple is situated in the Center of Jammu city and devotees can come to this temple from anywhere. Shri Ranbireshwar temple is considered as one of the biggest Shiva temples in the whole north of India, Popularly known with the name of Ranbireshwar temple, named after Maharaja Ranbir Singh. It was built by Maharaja Ranbir Singh, son of Maharaja Gulab Singh, the founder of Jammu and Kashmir princely State, in 1882.Currently Temple is managed by Jammu and Kashmir Trust Council. It is located on an elevated platform. The entry to it is from the west and a plain ground spans on the east side. 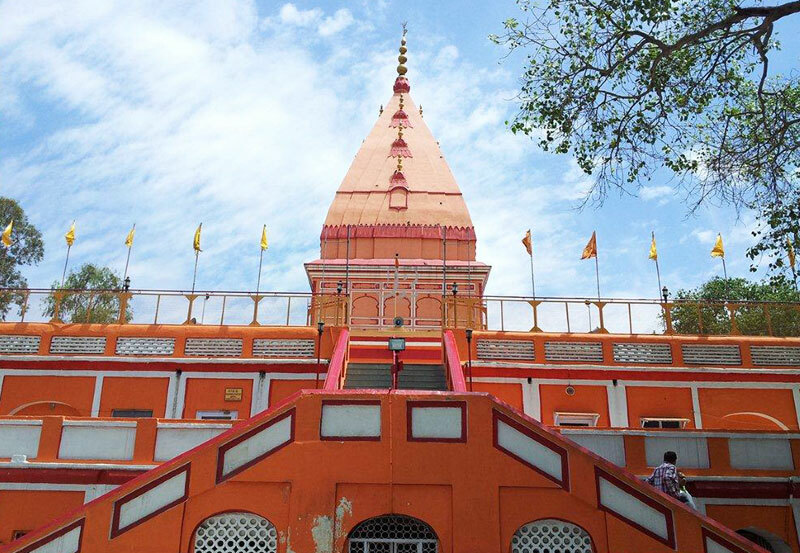 Ranbireshwar Temple offers you panoramic view of the hilly area. It has a big hall from the Verandah, which gives you Darshans of the two pairs of eleven Lingas and center having Largest Shiva Linga made of Black stone brought from Narmada River. One of Shiva Linga among these is made of crystal stone Shiva Lingam surrounded by small 12 shiva lingas, and rest are made of black stone. 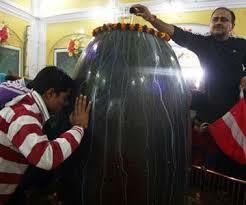 The Shiva linga placed in Jalhari is one of the biggest lingas, having height about 7-8 ft high. 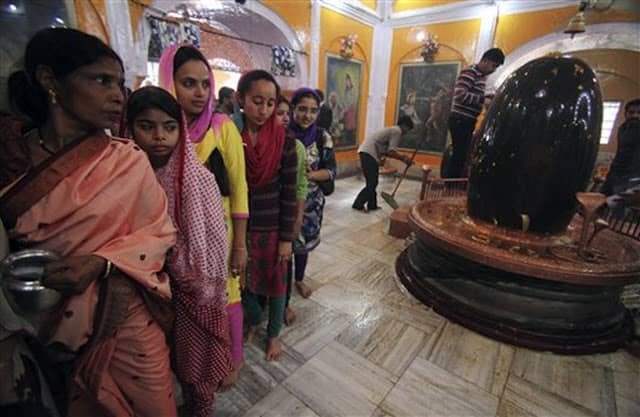 It is Located near the Shalimar Road built by Maharaja Ranbir Singh and is most famou in north of india by its centrally placed biggest ‘Lingam’ measuring seven and a half feet or around 8 ft of height (7.5-8.0 ft.). 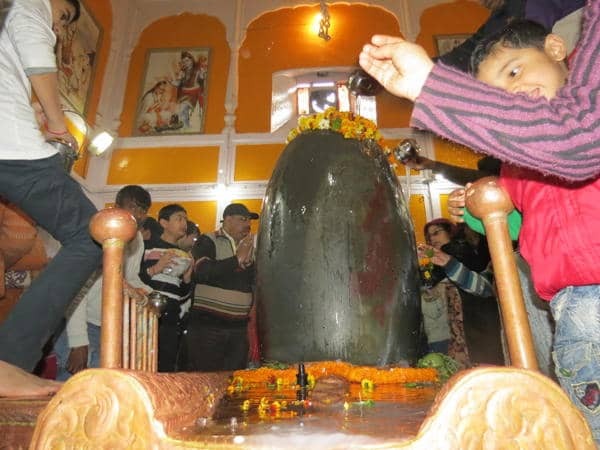 The 12 Shiva Lingas those are in the temple are made of crystal measuring from 15 cms To 38 cms and having galleries with many Shiva ‘Lingams’ fixed on stone slabs in both the sides of temple.Some of them are also made of Crystals too. 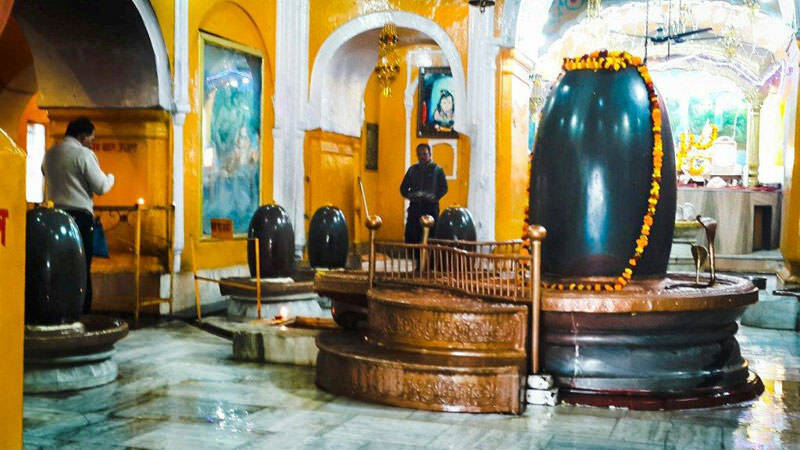 Other Shiva lingas are having height of 18 inches high and 12 inches wide.Slab inside the temple on the right and left side has around 1.25 lakhs Shiva-lingas brought from Narmada river in very small size. 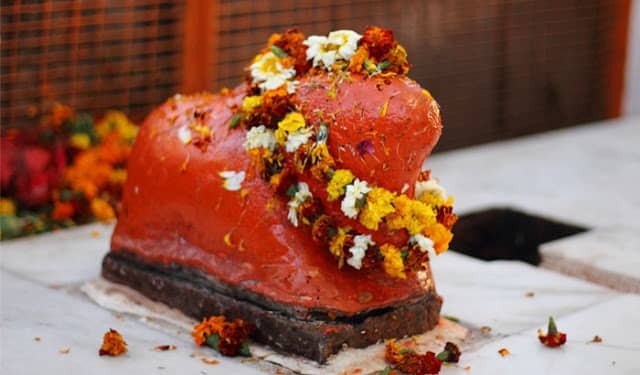 Centrally idol of Lord Shiva among Maa Gauri and Lord Ganesha is placed which is very beautiful and is considered to be unique as it is not present anywhere else. In the temple, stunning images of Lord Shiva and Maa Parvati made of marble are also displayed on the walls. The marble images of Lord Shiva carved on the black wall; big illustrations of Lord Ganesha, Kartikeya and Nandigan in the verandah and idols of Goddess Mahakali made by famous sculptors of Rajasthan are major highlights of the temple. Besides, devotees can find chinar and peepal tree within the premises. 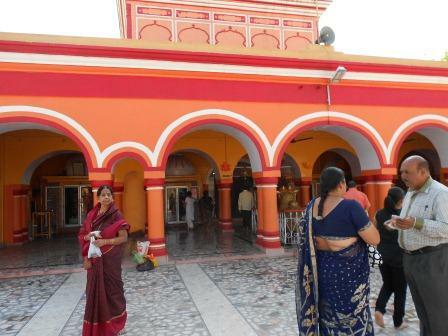 All major Hindu festivals are celebrated with much excitement at this temple. It’s a time to rejoice and pray to the almighty. To experience the festivities of this temple, one can visit Ranbireshwar Temple in January (Lohri or Makara Sankranti), Maha- Shiv Ratri ( Feb), March (Ram Navami) and October (Deepavali) when the city’s people regale themselves in a celebratory air. One of the features of the temple is that it is built on first floor and is situated at a big height from the road surface. The devotees have to take stairs to reach to the temple. 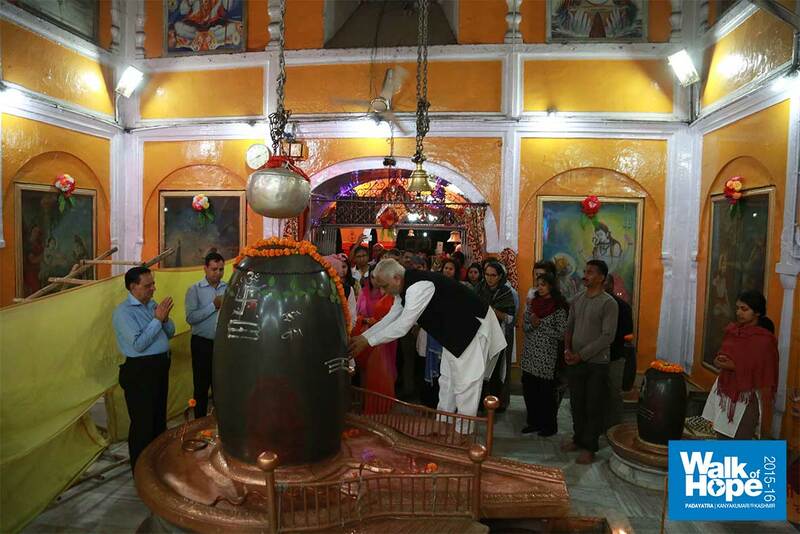 The main attraction of the temple is the idol and Biggest Shiv linga of Lord Shiva. There are also idols of Lord Ganesha, Kartikeya and Nandi Placed in the temple. 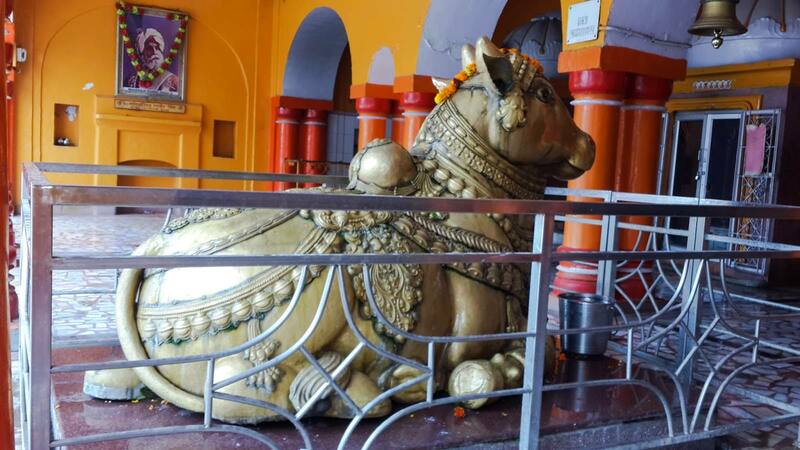 The idol of nandi is made of brass and weighs around 1000 kg. Beside this huge Idols of Lord Ganesha, Kartikeya Mahakali, and Panch Mukhi Hanuman are also installed in the veranda in front of the entry gate having huge Temple bell in the door.devotees visit this holy Jyotirlinga to acquire the blessings of the divine deity During Sharavan Mass and Maha Shiv Ratri and used to do Rudra Abhisheka among other Biggest Shiva lingam surrounded in temple in two pairs. 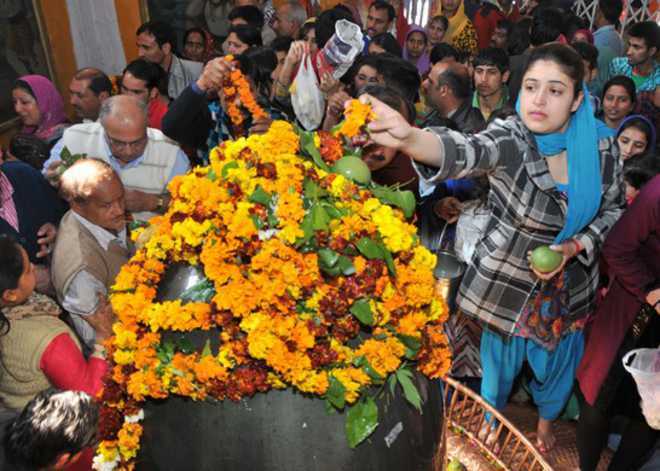 The temple is highly crowded on the major festivals like Lohri, Shiv- Ratri, Makara-Sakranti, Deepawali and Ram Navami. . The Maharaja Ranbir Singh laid the foundation stone of this temple in 1882 and all the Deities Idols were procured from Rajasthan and all the sacred linga brought from river Narmada and were brought in trains. Maharaja Ranbir Singh at R.S Pura personally received these. Later, these were carried to Jammu central place from Ranbir Singh Pura in a chariot with full devotion. The Maharaja himself pulled strings of the chariot assisted by his troops and thousands of other people singing bhajans in the praise of lord Shiva. The construction of the temple took two years. In the meantime, the Maharaja Ranbir Singh had fallen ill. 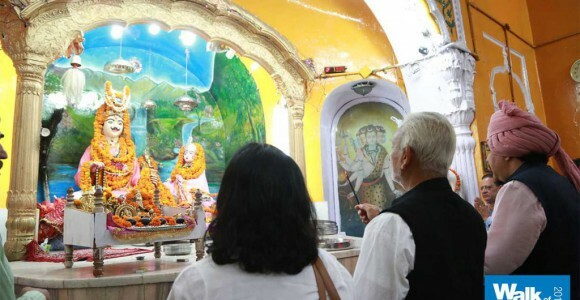 He, therefore, asked his younger brother, Raja Ram Singh to perform the inauguration ceremony of the temple. But due to time and circumstances, it was too not acceptable to the fate of Raja Ram singh. In spite of the best efforts, Shiva linga could not be placed in the vedi . 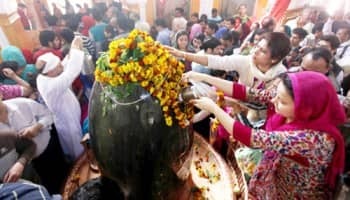 Consequently, the Maharaja Ranbir Singh though ailing, came personally to the temple, prayed to Lord Shiva and then with his own hands, helped by several other Shiva devotees mounted the lingam in the Holy vedi amidst chanting of ‘Har Har Mahadev’. 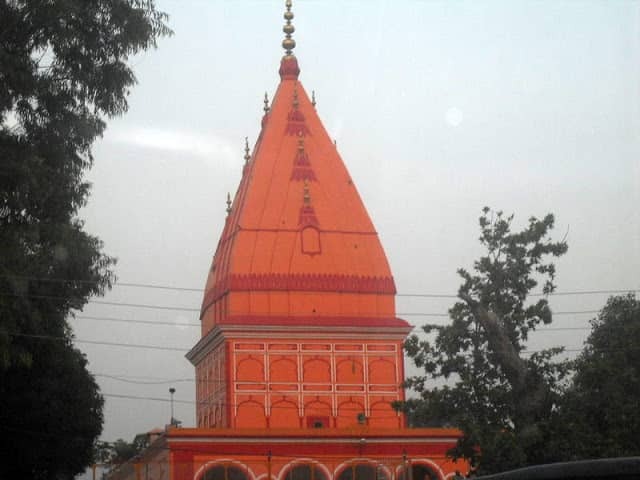 Local residents believe that Mahraja built this temple when Lord Shiva appeared in his dream. Mahabharat also mentions a story that says Arjun attained his powers after worshipping Jambu Devi in this area. Nearest Railway Station : Jammu Tawi, The temple is located at a distance of about approx 3 km from the railway station. Nearest Airport : Jammu Airport, which is around 8 km away from the temple. Photography: Not allowed any Camera, Mobile inside the temple.